About Product : Occasions are lining up… Marriages, festivities, gatherings and what not! Yet there is a part of you that demands to be at ease. As you carry yourself in these hand-woven Ikat sarees, there balanced vibrance brings you into a new light. When stares stop at the arresting array of patterns and the beaming you...You know you are the best version of yourself. 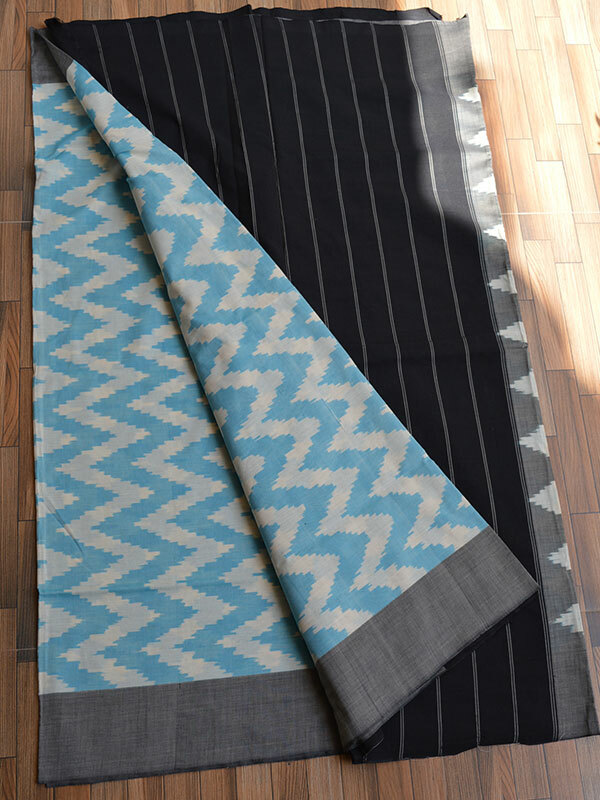 Pochampalli Ikat is named after a small town Pochampally near Hyderabad, Aandhra Pradesh.. 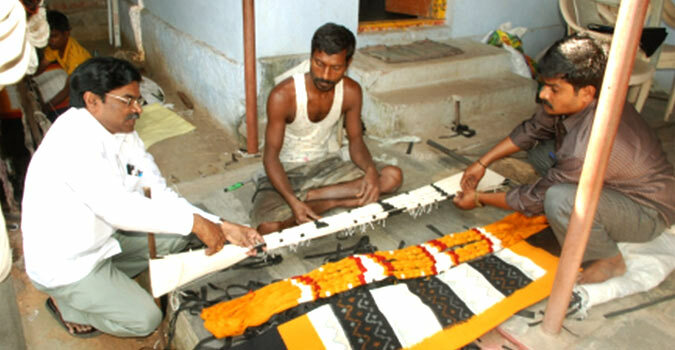 The technique of Ikat weaving, which requires true precision and skill, is believed to be brought in the town of Pochampally from Chirala where it is locally called as chit-ku. The intricate geometric design finds their way into the hands of skillful weavers and makes it to the market as beautiful sarees. Earlier only sarees were woven of Ikat but now dress material, fabric yardages, dupattas and scarf`s are also woven. The word “Ikat” comes from the Malay-Indonesian word for ‘tie’; it was introduced into European sources of textile technology and history in the early twentieth century when Dutch scholars began paying attention to the rich textile traditions of the Netherlands Indies, the present-day Indonesia. Depending on whether the tied fibres are applied to the warp or weft, the technique is identified as either warp Ikat or weft Ikat. A third variety, double Ikat, combines both warp- and weft-tied resist. For the pattern to be visible, the resist-dyed thread system has to be the prominent one, so for warp Ikat, the weave has to be warp-faced, and weft Ikat needs a weft-faced structure, which means that either warp or weft is predominantly visible. Plain weave is especially suitable for showing the Ikat's design, but for weft Ikat, a twill weave may also be used. Double Ikat, where the design is built up from both systems, should ideally by woven in a balanced weave, with warp and weft equally visible. 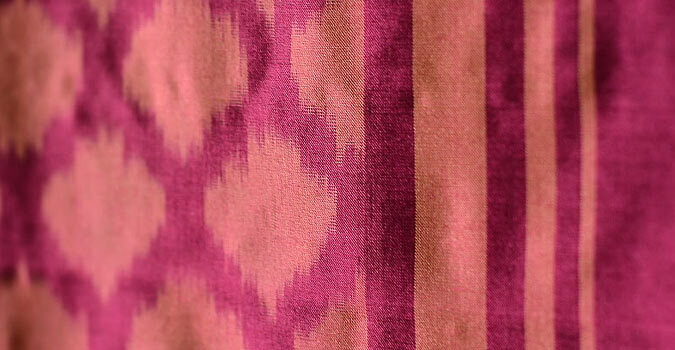 All textile fibres may be used for Ikat, although silk and cotton is the most common ones. Bangalore. This was the beginning of a revolutionary era in the Pochampally handloom industry. such as Chirala, Golkonda and Jalna are some of the known centres of pochampally Ikat sarees. The Ikat weaving is called by the name of “Chit-ku” in these places. exhibition and copied the design, says some experts. Most evidences suggest that Ikat weaving began in the late nineteenth century, when most of the original textiles were large scarves (rumal) made for export to Arabia. Only poor local fishermen and the people of low classes wore these cloths. In present times, the weavers are employed from Dravidian (Telugu-speaking) Hindu communities, namely Padmasalis and Devangs. 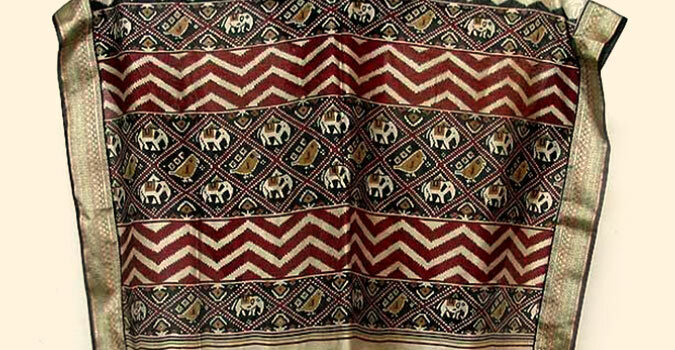 The earlier Pochampally Ikat sarees show designs closer to the Siddipet khans rather than the Ikat rumals. Like the khans, the borders of these early Pochampally Ikats were only embellished with supplementary-warp patterns. The end piece of the sarees consisted of a series of bands of different widths descending in size from the large central band. Unlike the khans, these bands were only embellished with weft-Ikat dyed threads. The 8-metre (26-foot) saree called zjanani, has Ikat bands in the endpiece and it was one the woven in Pochampally. 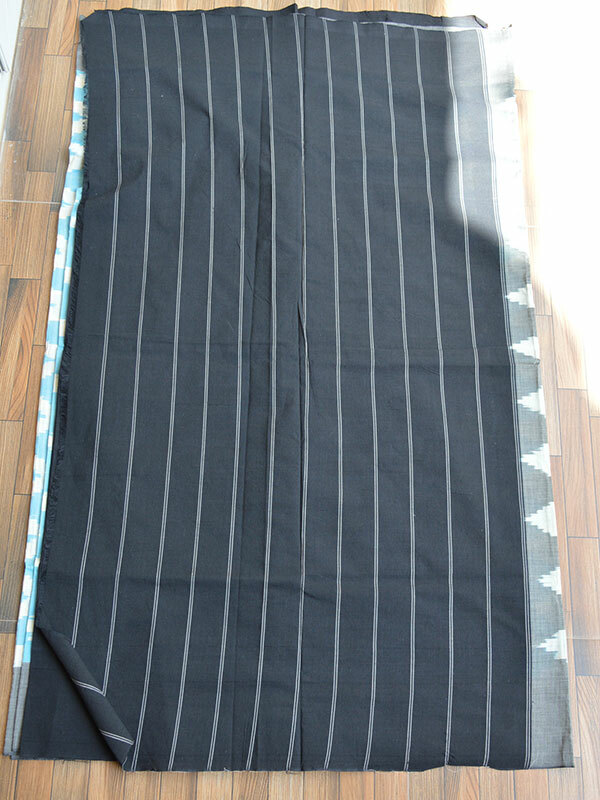 Even it has also been proved that the north in Bastar, the Dhurua tribal saree incorporated Ikat checks in its body. The Pochampally involves about 5000 handloom weavers who create sarees in traditional Ikat work. The characteristic features of pochampally Ikat sarees lie in the big, bold and bright patterning. The modernization of thought and choice has inspired the artisans to create modern motifs that are abstract, modernist and geometric with plenty of brilliant colours. The most modern pochampally Ikat sarees are vibrantly coloured and with wide range of modern designs. The weavers who are involved in creating pochampally saree follow a particular way for weaving the sarees. 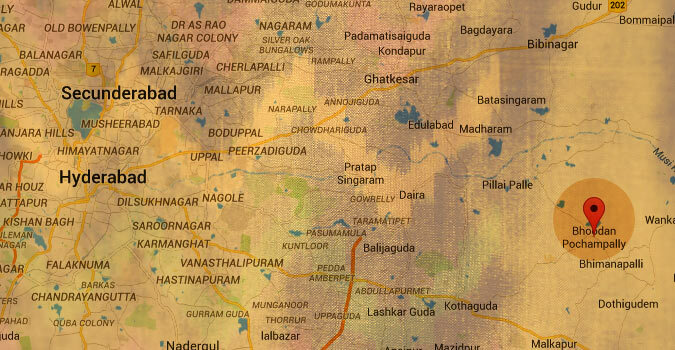 Since Pochampally is also called as the silk city; silk is used in weaving for Ikat. 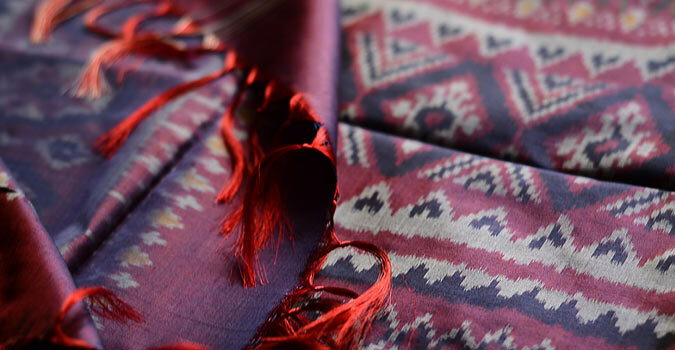 The Filature (local name) silk is used for Ikat weaving. 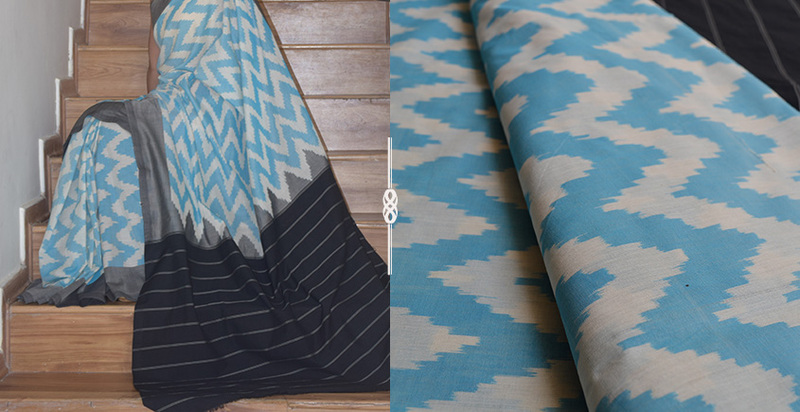 The yarn used for Ikat in Pohampally is thick giving fabric/ saree a stiffness it requires. 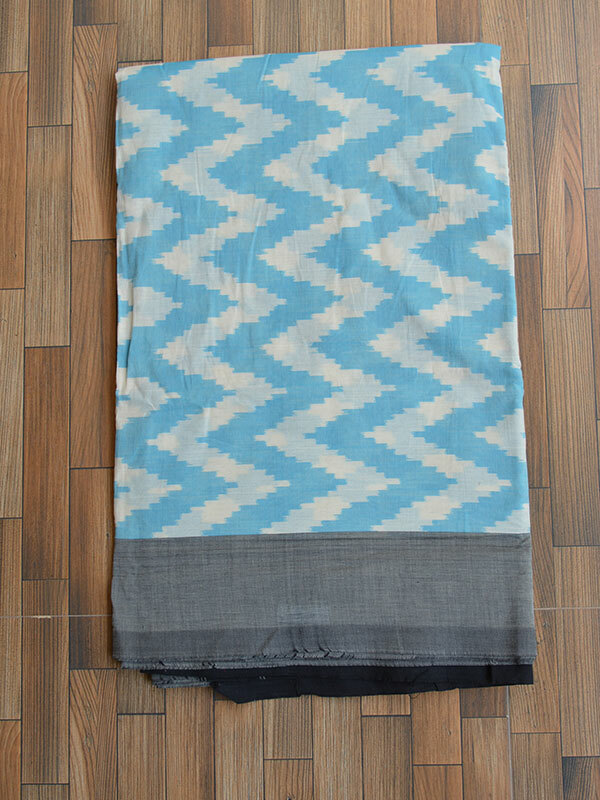 There are about 5000 handloom weavers in Pochampally who create sarees in traditional Ikat work. This saree is known for its unique design. The Ikat weaves involve the yarn being dyed first, with each strand dyed on the basis of the final pattern that has been decided. This means that everything has to be very precise and requires the skills of true artists. This method is very similar to the tie-and-dye method; the real difference being that here the yarn is dyed before weaving a rather complex procedure. The yarn for the wrap and the weft is stretched on wraping blocks in the form of quarter circle. They consist of one strong peg, connected with the circular segment of a wooden plank, studded with about 35 pegs at regular intervals. The thread – wrap as well as weft – is stretched on it and divided into a numbers of sets. Later the designs are tied in the sets. While the yarn is held on the wrapping block. 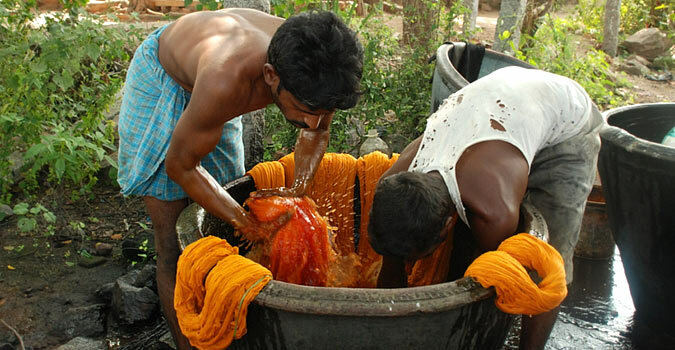 For dying the yarn is taken off, but when dry, it is again stretched, partly opened tied and for dyeing, a process which can be repeated several times. The red and brown design in white and black area achieved using alizarin dyes. For this the cloth is first soaked in mixture of castor oil and alkaline earth, then dried, again soaked, dipped in alizarin paste and finally boiled till it becomes red. For the brown shades, iton splinters are added to the colour. Dissolving iron splinters in vinegar produces black colour. Designs generally are worked out on graph paper. Great care must be taken in putting the wrap on the loom, keeping all the threads in position is necessary for the design to work. The natural movement during weaving gives Ikat designs a feathered edge which characterizes this technique. The famous Pochampally Ikat tie-and-dye saree has won Intellectual Property Rights protection. It is the first traditional Indian craft to receive this status of geographical branding. The design won protection in the Geographical Indications category. This will protect the pochampally handloom saree from unfair competition and counterfeit. Note The items in this category cannot be returned or exchanged. The products in this category is handmade. These might slightly differ from as seen on digital screen. Note As the product is handmade and every piece is unique, expect minute variation from shown design and shape. 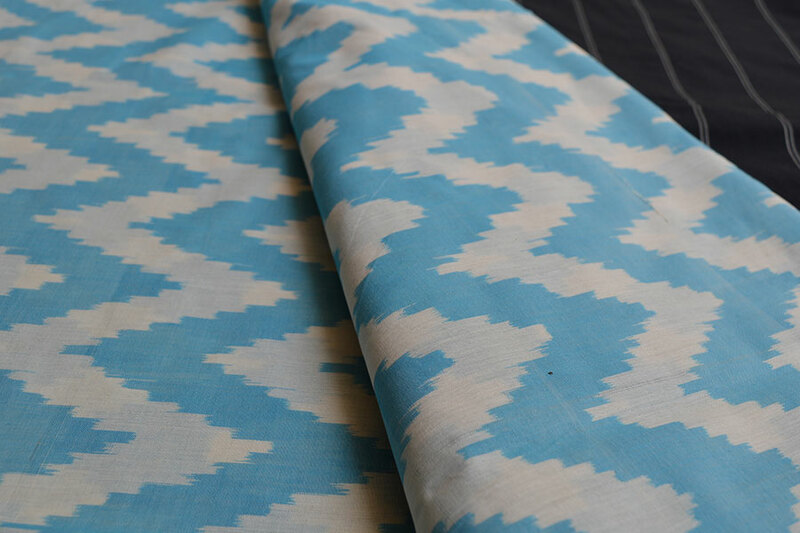 Pochampalli Ikat is named after a small town Pochampally near Hyderabad, Aandhra ..